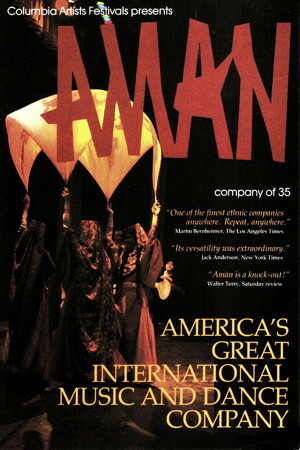 Information: AMAN was a folk dance ensemble (1963-2004). Anthony Shay was the artistic director of a folk dance performance group at the University of California Los Angeles (UCLA) called the Village Dancers. According to Dr. Shay, "The transition to the AMAN Folk Ensemble was actually only a name change. The same dancers who were in the Village Dancers in the summer of 1963 were performing under the AMAN name in late summer 1963." The newly named group was headed by Dr. Shay and Leona Wood as artistic directors and Philip Harland as music director. Shay held the position until 1977, when he left the company to form AVAZ International Dance Theatre. The legacy was continued under the forceful but superb artistic direction of Barry Glass. From its auspicious beginning to its demise, AMAN was home to more than five hundred dancers, singers, musicians, and administrative staff. During much of its time AMAN gave workshops and performances throughout Southern California to more than fifty-thousand young people, their teachers, and their parents each year. In the mid-1990s, the company began to have serious problems, prompted partly by financial woes, despite hundreds of thousands of dollars in gifts, grants, donations, and matching company funds, and partly because of sudden (if temporary) lack of a clear artistic vision when Barry Glass left during a power struggle. In March of 2000, Zan Dubin wrote in Dance Magazine, "Although arguably unique in the nation for its ethnic breadth, [AMAN] has been unable to erase a four-year-old deficit, now at $60,000, roughly one-tenth of its current budget, let alone hire more than one full-time administrator or adequately pay its nine full-time musicians and dancers." When the AMAN web domain was longer viable  the domain name was abandoned and resold  this wonderful folk dance ensemble, touted as "America's Great International Music and Dance Company" no longer had a web presence. In late 2002, the ensemble again put up a website. Still having money problems, its entire home page was dedicated to obtaining donations with a large headline reading "Support our $1 a Beat, $1 a Step Campaign" and a first paragraph that began, "Two Dollars . . . That's all we're asking. Not everyone can give $1,000, or even $25. So, we're asking for $2, the same $2 that you would normally spend on your coffee, snack, even bottled water." Continuing to be haunted by the specter of financial overburden, AMAN began selling off hundreds of the company's incredible costumes, even advertising a "$10 Big Bag Sale!" in July of 2003 for anyone to "Bring your own standard plastic grocery bag and fill it with goods for only $10! Costumes, fabrics, jewelry, shoes, and more!" By April of 2004, AMAN directors had voted to disband the company and hired a contractor to broadcast a for-sale e-mail offering "One of a kind aprons! Handmade headresses! Skirts, blouses, lace skirts! Scarfs! All here and at bargain basement prices!" The prices were so good, however, AMAN directors had to rescind items listed for sale and refund most of the money tendered for costumes. It became really sad to see what once was such a wonderful institution coming apart at the seams (so to speak). In their May-June 2004 issue of FolkWorks magazine, Leda and Steve Shapiro wrote, "AMAN Folk Ensemble has officially announced it is closing its doors," and quoted former Artistic Director Rosina Didyk as saying, "We thought about dancing with recorded music to cut costs, but that's not who we are or what we do. None of AMAN's performers or staff were willing to sacrifice the quality of performances just to make it through economic times like this." AMAN decided to complete its Spring 2004 season with its "Building Family Bonds Through Dance" workshops on the final financial dregs of a grant from the City of Los Angeles Cultural Affairs Department. In April, 2004, the company closed its doors. While AMAN alumni mourn the company's demise, there is a light at the end of the tunnel. As reported in FolkWorks, AMAN board members and alumni Madelyn Taylor and Ian Price are carrying on the AMAN name and tradition by creating a folk dance co-op, Café AMAN, a multi-cultural music and social dance cooperative with emphasis on the Balkans. AMAN's vast collection of original recordings, videos, photos, and press clippings are now part of the UCLA Ethnomusicology Archive Collection and UCLA's University Archives. Folkraft Record Company, a list.